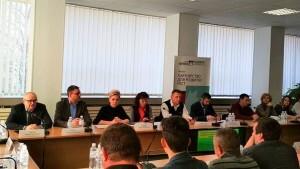 Today, on March 6, Zaporizhia Chamber of Commerce and Industry hosts the first “round table” format session on sharing experience in social entrepreneurship. The session welcomed representatives of regional and city council, Zaporizhia Chamber of Commerce and Industry, social enterprises, and NGOs. The event was organized by Executive Committee of Zaporizhia City Council with participation of PLEDDG Project’s reprersentatives. In his opening speech, Zaporizhia Deputy Mayor Valerii Edeliev noted that social entrepreneurship was not a charity activity but entrepreneurship in the first place. – Today we have gathered together in order to make the so-called inventorying of Zaporizhia social enterprises and learn how they build their own business, which problems they have and what prospects they see. Social entrepreneurship enables people from vulnerable segments of the population to set up their own business, to fulfill their capacities and make money from this, replenishing budget thereby. The objective of authorities is to help in organization matters and to attract investments. When the city receives financial flows, businesses will see it to themselves how to profit on them, – Valerii Edeliev said. Valeriy Kokot, PLEDDG Senior Expert in Business Development, reported that such type of small and medium business as social entrepreneurship had been on the rise over the last years. People from vulnerable segments of the population – ATO veterans, displaced people from the Crimea and Eastern Ukraine, disabled people, and others – should receive an opportunity to earn by themselves but not only rely on the state aid. By now PLEDDG Project has provided grant aid to four social enterprises of Ukraine. These are SE “Harmony” and “Open Hearts” (Vinnytsia, work for disabled people in services sector, folk craft, agriculture); “Light of Hope” (Poltava, employment in apparel production for women discharged from detention facilities). And the fourth project is our “Association of Zaporizhia ATO Veterans” specializing in re-training of combat veterans who have been to Eastern Ukraine. During the session, the round table participants familiarized themselves with 12 presentation of social enterprises, predominantly, from Zaporizhia and some coming from the region. The scope of activity was the widest one: children’s technical crafts, green tourism, reuse of discarded clothes, establishing manufacturing of soft and leather goods, development of space for business and creativity, farming, etc. Behind many presentations were the destinies of people who have not recovered from social disturbance only but also have found a nerve to set up their own business. The “round table” participants had a lively exchange of information and contacts which would further lead to concluding of contracts. It should be noted that on February 8, the Social Entrepreneurship Union was established with a view to providing assistance to newbies.